Entertaining has always sort of been my thing. I don't know what it is, but ever since we got married, I just love inviting our friends and family over for little parties throughout the year. It's actually one of the things I looked most forward to when we were engaged. And so today I thought I'd share with you a couple of my entertaining favorites including a few ideas on how to set your table in style. Crate and Barrel has to be one of my favorite go-to places when it comes to finding unique entertaining pieces. From the prettiest dinnerware to place mats and flatware, Crate and Barrel really does have it all. And they've made it super easy to set your tables in style. 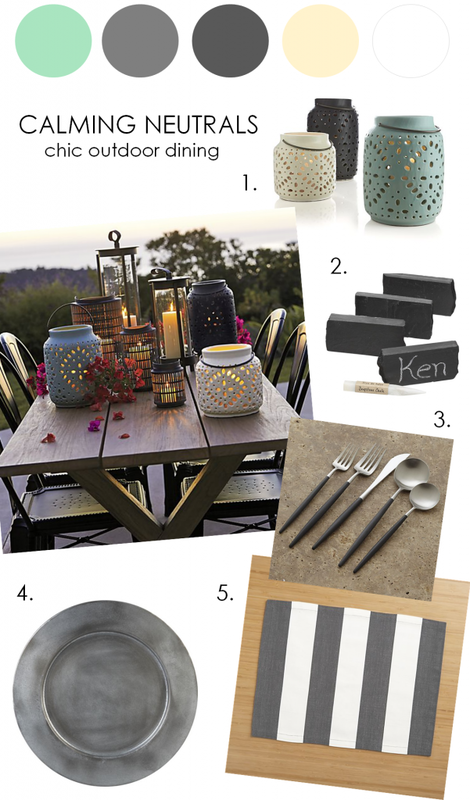 For this first look, I combined the idea of outdoor dining with calming neutrals and plenty of candlelight. I'm loving these colors, those adorable little chalkboard place cards, and those striped place mats! This is definitely my idea of the perfect Summer party. It's casual, it's chic, and it's got plenty of ambiance with all of these lanterns and the soft glow of candlelight! Next up, is this pretty blue look. Here, I've mixed these bright printed pieces with a neutral tablecloth. This is a look that I just love for Summer, and it's definitely one that you can easily create. I love those rectangular dishes. And those candle holders! Can we all just take a second and look at these candle holders? Such a beautiful accent piece that makes it feel all the more special. Next up, we have this gorgeous everyday look that is accented with succulents and natural earth tones. It's a look that I honestly can't get enough of. Such soothing colors, if you ask me. Plus who says that your everyday dinnerware has to be plain old white? I'm loving this unique take on everyday dishes! And this flatware? Yeah, I'm thinking I'm going to have to order a set for myself. So super cute, if you ask me! So there you have it! Just a few of my favorite entertaining pieces from our friends over at Crate and Barrel. Guys, I'm not going to lie. If I had to choose just one of these, I'd have a really hard time. Because each of these looks is just so inviting! But lucky for you, you don't have to choose! I say register for all 3! I'd use earth tones for everyday, the blue patterned look for Summer, and the pretty outdoor pieces for when the weather is nice and you want to entertain outside! Makes total sense to me. So what are you waiting for? Hop on over to Crate and Barrel and start adding these lovelies to your registry! It's super easy to register plus they have tons of other entertaining pieces that are just as swoon-worthy! Oh, and don't miss out on the special events they they put on at their store locations! Find your perfect entertaining style with the help of an expert. 9 Comments " Creative Entertaining Ideas from Crate and Barrel "
Those chilly shades of blue look amazing with the silver sequins! Love it! I'm so in love with the use of the deep greens and that bright blue! So stunning! Gorgeous shades of indigo! Great, creative linen. Such a stunning shoot! All the girls look GORGEOUS! Allassignmenthelp is a site that is doing a fine job in providing online assignment help to the students. You can expect to get a fantastic Programming Assignment Help written by qualified writers using our service.